Read-options, run-pass options, zone-reads, play-action, pre-snap motion—these are the tools smart coaches are using to overcome the traditional deficiencies that have crept into the NFL because of the proliferation of spread offenses at the game’s lower levels. Then there is the paleozoic stubbornness of Bills head coach Sean McDermott and offensive coordinator Rick Dennison, who have insisted on making Taylor something he’s not, only to fault Taylor the moment things began to go south after a surprising 5-2 start. “This is about becoming a better team,” McDermott said to justify his decision, just two days after declaring, “Tyrod’s our starter.” The Bills reportedly embarked on a “long study of their offense” in the interim, determining that Taylor wasn’t aggressive enough and that they were plagued by too many three-and-outs (27.8 percent, which ranked 26th in the league). Dennison is frequently putting Taylor on bootlegs and rollouts, where Taylor’s limited field vision and pocket poise are nonfactors. Taylor, for the most part, sees the field well when he’s outside the pocket, and at times he’s one of the league’s best touch passers. This includes throwing downfield. Dennison has featured route combinations that give Taylor multiple options all on the same side of the field. The reads become more defined, and if Taylor doesn’t like them, he’s in a better position to scramble. A few sentences later, Benoit suggested this has less to do with Taylor (and with what Taylor can or cannot do), than with McDermott: “McDermott is known to be almost obnoxious in stressing turnover prevention.” Taylor’s interception rate (1.1 percent) ranks third-best in the league, even now. His aggressiveness, measured by passes to targets within one yard or less of a defender, is 14.3 percent, which ranks third-lowest. He’s been doing exactly what the Bills want him to do. But the Bills haven’t exactly set Taylor up to succeed. The team’s running game, led by LeSean McCoy, has gone from first in rushing DVOA in 2016 to 25th this year. A reason? 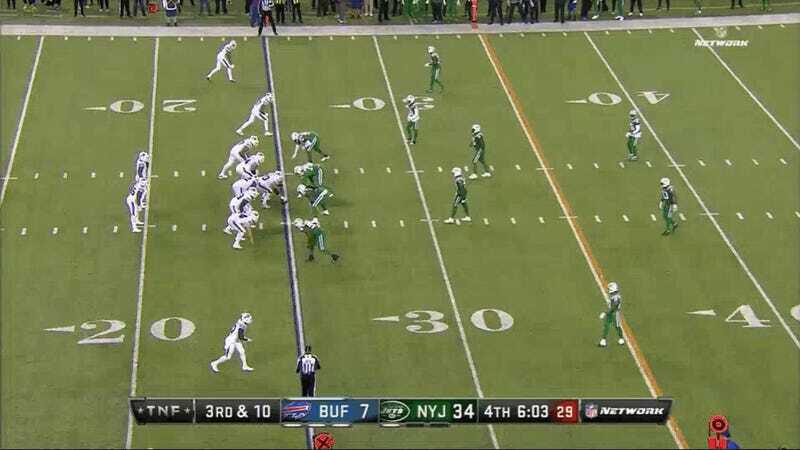 Per ESPN’s Bill Barnwell, Dennison has had McCoy run out of the shotgun on just 30 of his 170 rushes this season. McCoy had averaged 5.3 yards per carry out of the gun last year, versus 3.9 YPC when the QB was under center. This year, Barnwell added, McCoy has a better YPC from under center than out of the gun (4.2 to 3.7), but his all-around production has dropped off considerably. Also, according to Pro Football Focus, the Bills have only had Taylor use play-action on just 21.8 percent of his dropbacks, 15th-most in the league. Their willingness to exploit what Taylor can do only seems to extend so far. Additionally, before the season, Buffalo also traded away Sammy Watkins, its best deep threat, and Taylor has relied heavily on throwing to his running backs, while using formations reliant on extra running backs and tight ends, rather than additional receivers. Late in a Week 9 loss to the Jets—a game in which Taylor endured a season-high seven sacks and was hit 11 times—CBS analyst Tony Romo noticed that the Jets were able to tee off on Taylor because they weren’t afraid to play one-on-one on the outside. The Bills had traded that week for wideout Kelvin Benjamin, who was inactive that night because he had just joined the team. But Benjamin is a big target not known for getting separation. This gets to a common critique of Taylor’s game: that he frequently fails to throw the ball to open receivers, or to anticipate ways in which he can lead a covered receiver into an opening. Pressed on the subject, he continues. Since taking over earlier this year, McDermott and general manager Brandon Beane have embarked on a thorough tear-down—the sort of moves that won them a lot of praise for instituting a “culture change,” a popular new-regime tactic in the football-man vernacular—but they also always seem to have it in for Taylor, too. The benching just turned out to be the logical conclusion of this head-scratching approach. After two blowout losses, McDermott finally found his reason, even as the Bills entered Week 11 with a 5-4 record, in an AFC that right now has just five teams above .500. 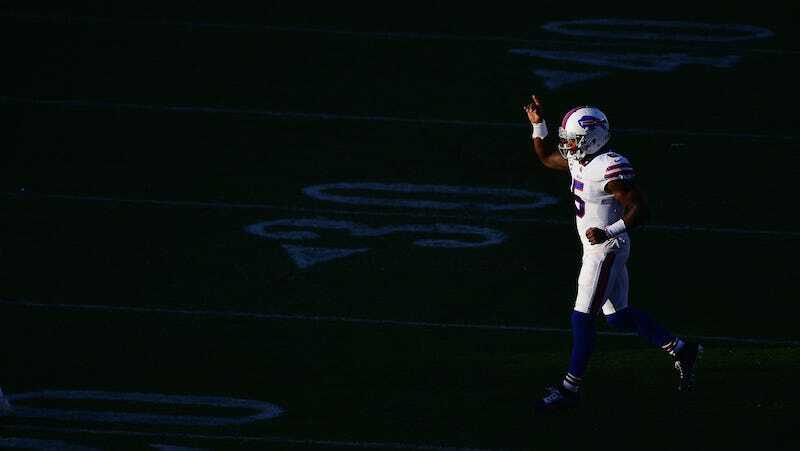 It’s one thing for the Bills to not see Taylor as their quarterback of the future, as though some pro-style, pocket-passing unicorn will be so much easier to find next year. It’s quite another to bail on the present when a wild-card spot was still very much within view. For a franchise that hasn’t been to the postseason in 18 years, this was coaching malpractice. * A previous version of this sentence did not include the words “quick-read,” which more accurately describes the system Jared Goff is using with the Rams.